I've done my best to add to my 106 patch year total over the last couple of days, but despite my best efforts in a mixture of fog and winter sunshine I've failed to locate a Woodcock, Little Owl or even a Yellow-legged Gull to add to this score, so it looks as if an admirable 106 will be my final 2016 total. The patch's 2nd Yellow-browed Warbler of the year remains in situ on Alexandra Lake - we're all hoping that hangs around until the 1st of Jan or even the day after (I may struggle to make the 1st due the sizeable hangover I'm expecting). The rest of the patch remains deathly quiet apart from a single Stonechat on the western side of the Flats, near the Cat and Dog pond which in todays warm winter light seemed to glow from its dead nettle perch. 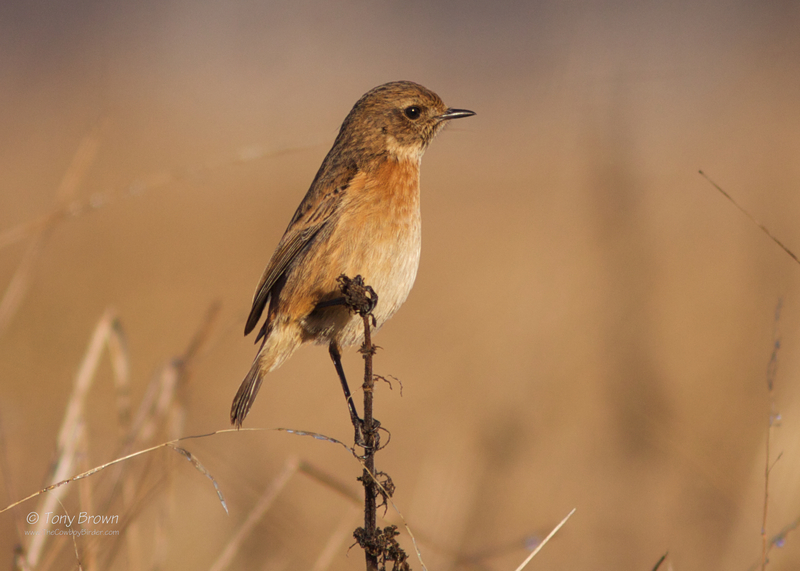 Just an old school Stonechat - not Stejnegers's, Siberian or even Caspian. In a year in which I continued to give the patch almost all of my limited spare time, often choosing to tread the same pathways week after week over the opportunity to go birding elsewhere or even twitch something, I feel this decision has been duly rewarded with five quality new birds added to the patch list (Cettis Warbler, Ortolan Bunting, Yellow-browed Warbler, White-fronted goose and Great Grey Shrike) all of which has kept my interest firmly focused locally - and as long as the birding gods continue to deliver these little gifts now and then I'll continue to happily give it my precious spare time. All the best for next year Tony and keep blogging! Thanks - and all the best to you as well Mr G.